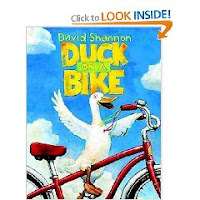 This title of this post is pretty silly, but I love the book, "Duck on a Bike," by David Shannon. Sometimes I write about all these book I love and I think these people must think I'm a bit off my rocker. I guess I need to find all that silly stuff fun to be enjoying preschoolers for so many years. Now that I'm off point, the "Duck on a Bike" title just is one of those things that I say over and over--I find it funny--sorry. So when I was trying to think of a title I came up with this one. By the way if you ever get a chance to read this book, do. It's really cute. 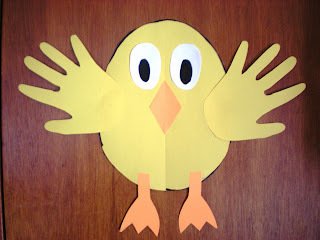 Anyway, my kindergartner made a really cute craft that I wanted to share with you. These ducks, probably ducklings because they are yellow, are all hanging from the ceiling in his classroom, they really add so much character. Also, I wasn't sure if it was a duck or chick, but I thought the feet looked webbed so I deciphered duck. When mine was done it looked quite chick-like too. 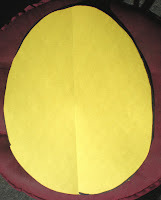 If you would like you, can make an egg pattern and have each child trace it onto a piece of 9 x 12 yellow construction paper, then let them cut it out. If it's easier you can have this predrawn and then let them cut it out. Next trace one hand on a folded piece of yellow paper and cut out two hands. You will also need two orange webbed feet, an orange diamond shaped beak, and two oval eyes from white. 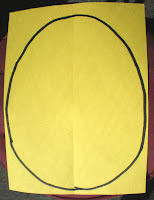 Dont' forget to add two big pupils in the ovals with marker or crayon. 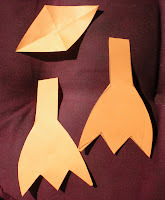 The kindergartner class all cut these out on their own, you can decide with your age children what will work best. The last step is to glue them all together and show it off for everyone to see. Okay- it's scary how our brains are often on the same page! We just read this book last night. I love Duck on a Bike! Thank you for your loving message. I know a little English, so I understand what you say ... I've more difficulty in writing so forgive me the mistakes. I also like to see the activities that you develop with your children. This is so cute, I'm going to save this one so I'll remember to do it when she can cut. I remember doing things like this, without fail someone always clipped off a finger. Those are my favorite the slightly mangled ones, too cute and you know they worked so hard on it! One little boy had only stumps for fingers and he was so proud, this was in my special day class and cutting was a huge challenge.